Tailhook Daily Briefing: Live From Reno! 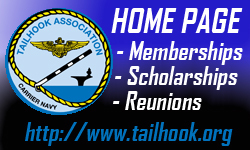 The Tailhook Association will be broadcasting live from this year’s Symposium! We plan to broadcast the symposium over the internet on Friday 7 September and Saturday 8 September. The links are listed below. Listen in, if you can’t make it!